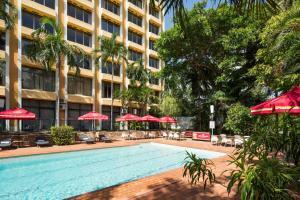 Located in Darwin City, Palms Motel is a perfect starting point from which to explore Darwin. Offering a variety of facilities and services, the hotel provides all you need for a good night's sleep. Daily housekeeping, fax machine, laundromat, photocopying, postal service are just some of the facilities on offer. All rooms are designed and decorated to make guests feel right at home, and some rooms come with television LCD/plasma screen, non smoking rooms, air conditioning, heating, desk. The hotel's peaceful atmosphere extends to its recreational facilities which include golf course (within 3 km), outdoor pool, garden. Discover all Darwin has to offer by making Palms Motel your base.